Hey guys, are you all aware of this Ortovox recall from a few months ago regarding what version your transceiver is running. They will upgrade free of charge. Shipping was covered in Europe as well. If yours are running version 2.1 then contact them asap. Recently relocated to Germany, Frankfurt area, and looking for like minded souls to hook up with for trips in Austria, Switzerland Czech and German hills. Been splitting since 2008. I have recently moved to Frankfurt area from the UK and looking to hook up with some new riding buddies to explore, German, Austria, Czech and Swiss hills. Been splitting since a 2008 trip to Kashmir and boarding since 1993. I’ve just moved to Frankfurt area from the UK and looking for Split partners as well. Would like to explore the Czech mountains and more in Austria. Hit me up if still interested. Hey D, i’m now located in Germany (south of Frankfurt) from the UK. Looking to get back on my split after a knee op last year. I’ve had a couple of weeks on my solid with the family in Austria over New Year to test the knee and all good. Might be up for a trip in Switzerland and Austria. Do you still have any plans? Ideas? A knee injury and new family pressure forces me to sell all my backcountry kit. No more split trips for me. Hey, I was in the Pryrenees last winter and did the same, converted my van and toured from it. Just did mainly the French side but has massive potential and Pyrenees got more snow than the Alps last winter. How did the Trew gear hold up this winter? Ended up getting a jacket and pants too. Still another 6 weeks before I can try it out. Awesome gear though! 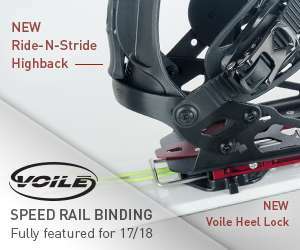 Burton apparently done a colab with Spark next season and also with Voile with a new interface for the channel system. Looks good and can’t wait to try next season. I do a lot of mountain biking at night and these are the best lights I have come across. They do all attachments for helmets too. Best way I have split a board is with a Festool circular saw on their guide rail system. It’s expensive kit so you will need to know a carpenter or joiner who has one. Once you cramp the guide rail to the board, you get a perfectly straight cut. It’s works on a plunge action and can adjust in millimetre increments. We’ve just got Trew gear into the UK this season and I really like it. They have a woman’s range too and have a bib pant.